Kim Kardashian is putting a modern twist on the traditional baby shower. The mother-of-three is getting ready to welcome baby no. 4 with hubby Kanye Westand what better way to celebrate the pregnancy than a CBD-themed baby shower. For the occasion, the Carolina Lemke x Kim Kardashian West designer is doing away with the typical games and gifts in favor of a more mature party that includes massages and more. "This year, because I am freaking out so much, I just want a zen-like CBD-themed baby shower," the KKW Beauty guru tells E! News. "I just want massages, I want to do like a tea ceremony with crystals and we're going to have a drink at this baby shower — we're not pregnant." In Kim's words, this isn't the typical baby shower, "This is the massages for all, like just meditation, calm before the storm baby shower." More importantly, the gathering is for her kids North, Saint and Chicago West to see that there is actually a baby brother coming in the near future. She explains, "When you have a surrogate, for me, I realized that having a baby shower for Chi was actually so much more beneficial for my kids, because they saw people come. They actually saw that it was like, 'A new baby is coming.' They got so excited for Chi to come that way, seeing that everyone was coming to celebrate the baby, so i'm actually really doing it for them." As for the baby boy's name, Kim and Kanye are still pondering potential monikers for the little one. At first, it seemed like the reality star was leaning towards Rob in honor of her brother Rob Kardashian and late father, but now she is second guessing the choice since the traditional name wouldn't fit with the siblings' unique names. However, there is one thing that is keeping the mom from crossing the name off the list entirely and that's a surreal experience she had on vacation. 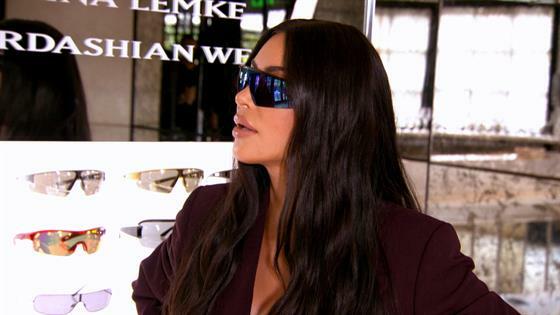 "You'll see when we go to Bali there might be a deeper reason for why I would want that name," Kim hints at an upcoming episode of Keeping Up With the Kardashians. "This blind palm reader gave me some really crazy information when I was in Bali, so you will see that." Clearly, the influencer has a lot on her plate, with a baby on the way, a sunglasses collection being launched and raising her kids. So her tips for maintaining her chic sense of style while on the run incorporates the unisex Kim Kardashian West Collection for Caroline Lemke. The $90 shades are the perfect accessory for any outfit and the totally reasonable price makes it a bit easier when your 5-year-old runs off with your clothes. Kim laughs, "I don't know what North is taking of mine and wearing." To find out what else Kim dishes on, check out the videos above!